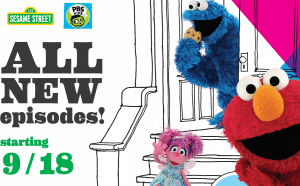 On Monday, September 18, 2017, everybody’s favorite furry monsters debut an all-new season of Sesame Street on CPTV! Now in its 47th season, Sesame Street will introduce a kindness curriculum to foster behaviors that can have significant outcomes throughout a child’s life. Sesame Street’s lovable monsters and diverse human cast model positive interactions by valuing inclusion, listening to, and respecting others, and being empathetic, warm, and generous, teaching kids how to be compassionate citizens. Season 47 will also introduce a reimagined “Elmo’s World” segment, staring everybody’s favorite red monster! Tony Award-winning Bill Irwin returns as Mr. Noodle, and he has brought some new family members to join the fun; new characters include Mr. Noodle’s two brothers, played by the Tony and Grammy Award-winning Daveed Diggs from Broadway’s Hamilton and comedian Daniel Koren, and real pet dogs Schmoodle, Floodle, and Frank. Sesame Street airs as part of the CPTV Kids lineup weekdays at 11:30 a.m. and 12 p.m.
on your station and grow audiences beyond launch.